My first week of school includes decorating, setting up centers, and putting final touches in my classroom. I enjoy setting up my classroom because of the design aspect. So, I thought that I would write about how I go about designing my room for TAB. This year I am moving to a new room. It is exciting because it will be renovated next summer. The moving process was hectic. (The pictures are from some work I did today. YIKES!) I had to get rid of some old furniture and acquire furniture from other teachers. I will be sharing every part of this transformation so remember this is a work in progress. As I was moving furniture today, I was thinking about what type of consideration I need to make to make this room work. Sink location will determine how to set up an art classroom. My room has one sink in the corner. What to consider when designing an elementary TAB classroom? When setting up a classroom, it is essential to think about what is permanently in the space. Are there sinks? Cabinets? Shelves? Anything that cannot be moved will definitely influence the design. The sink will be the key to the art room. I have one sink in this room. The painting and clay center will have to go near this area. I usually keep some other options on getting water for students in the clay center. (We can look at that later.) Once the sink and painting center are established, there are more choices to think about. There are a few different types of storage to think about. Most of the supplies will be housed in each center, but I never put out too many items for elementary students. We will cover each one. 1) Supplies: Most of the supplies will be housed in each center, but I never put out too many items for elementary students. This room does not have a supply closet and only has two sets of cabinets. So, I think that I will keep a shelf in my desk area to hold extra supplies. This way I can easily get to it and it is off limits to students. 2) Student Projects: I have found that most k-2 students will complete art projects very quickly. So, I plan a small storage area from them. 3-5 students will get a bigger area to hold their projects. This is also a good time to think about storage for sketchbooks, journals, or portfolios. This will be my desk area. The industrial shelf will be for the extra supplies. I will make it taller another time. This wall is opposite from my desk. I am thinking that the white cabinets will be used as project storage. I want to add additional shelves to the top. A teacher desk should face and see the whole classroom. So far, I have planned the painting center and storage. I also had to plan out an area for my desk. I just picked a corner of the room that as a bit awkward shape to hold the extra supplies. A few rules that I like to talk about when setting up a teacher desk area. Always make sure that the desk is in a position that will face and see the whole classroom. I like to also have wall space to hang up schedules, emergency paper work, sub information, etc. It is nice to have a cabinet or drawer that will lock for purse and expensive items. Lastly, I think about a place for students to turn in WOW work. This year that will be located on the table with the painting on it. Drawing and textile center can be very small, and I usually think of those last. My digital art center has grown over the past few years. That would be a good one to start with. I have some small gray tables to hold 6 Mac computers. I placed a shelf in the corner for iPads, stop motion props, etc. This areas is directly across from my desk. Clay and sculpture center are next on the list. Clay will go into the corner of the room. Sculpture will be in the remaining brown cabinets. I like to have a lot of open room for the clay center. I will add some shelves in that corner later. It currently is storing classroom items for another teacher. Sculpture center will work great at the brown cabinets. I am considering removing the doors and adding buckets on the tops of the counters for the students to look for items. Future Clay center will be in the left corner. Sculpture will be in the brown cabinets. Drawing center will be on the white shelf near my desk. I am still thinking about collage center, and how to hold paper materials this year. I think this is a great start so far. I hope that this helps with other TAB room designs. I missed something intentionally! That is the front of the room or whiteboard. Most of my students will have Chromebooks, so I am using a mobile TV for all of that. I am definitely in a smaller room. I need to be creative! 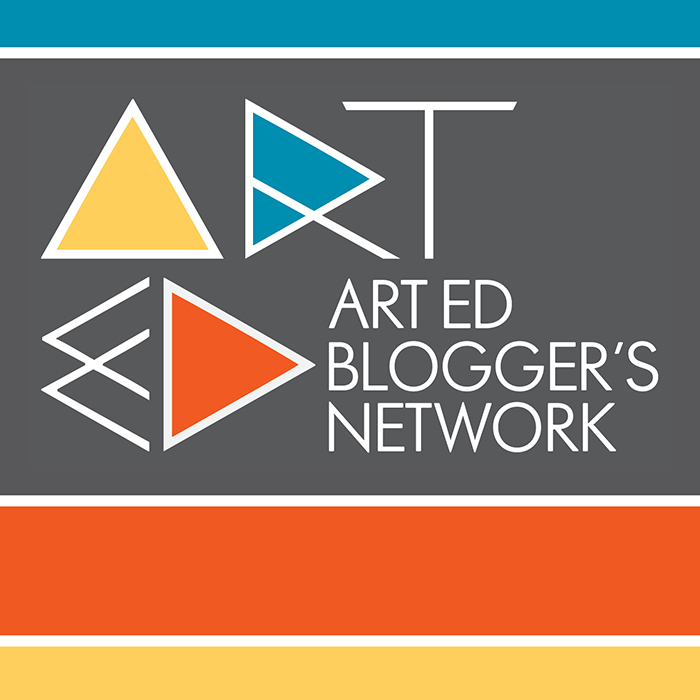 ﻿ This post is a part of The Art Ed Blogger's Network: Monthly Tips and Inspiration from Art Teacher Blogs. On the second Tuesday each month, each of these art teacher blogs will post their best ideas on the same topic.